Scherner, F., Riul, P., Bastos, E., Bouzon, Z. L., Pagliosa, P. R., Blankensteyn, A., Oliveira, E. C. & Horta, P. A. Herbivory in a Rhodolith Bed: a Structuring Factor?. Pan-American Journal of Aquatic Sciences, 5(3): 358-366. Download PDF file (290 Kb). Modesto, G. A., Maia, E. P., Oliveira, A. & Brito, L. O. Utiliza��o de Crassostrea rhizophorae (Guilding 1828) no tratamento dos efluentes do cultivo de Litopenaeus vannamei (Boone 1931). Pan-American Journal of Aquatic Sciences, 5(3): 367-375. Download PDF file (220 Kb). Castillo-Soriano, F. A., Ibarra-Junqueira, V., Olivo-Ortiz, A., Barrag�n-V�zquez, F. J. & Meyer-Willerer, A. O. Influence of water supply chemistry on white shrimp (Litopenaeus vannamei) culture in low-salinity and zero-water exchange ponds. Pan-American Journal of Aquatic Sciences, 5(3): 376-386. Download PDF file (275 Kb). Boussou, C. K., Konan, F. K., Edia, E. O., Ouattara, M., Bony, Y. K., Ouattara, A. & Gour�ne, G. Morphometric analysis of populations of Chromidotilapia guntheri (Sauvage, 1882) (Cichlidae, perciformes) in four coastal rivers of C�te d�Ivoire (West Africa). Pan-American Journal of Aquatic Sciences, 5(3): 387-400. Download PDF file (733 Kb). Rosa, M. R. & Gadig, O. B. F. Taxonomic comments and an identification key to species for the Smooth-hound sharks genus Mustelus Link, 1790 (Chondrichthyes: Triakidae) from the Western South Atlantic. Pan-American Journal of Aquatic Sciences, 5(3): 401-413. Download PDF file (385 Kb). Sonnenholzner, J. I., Monta�o-Moctezuma, G. & Searcy-Bernal, R. Effect of three tagging methods on the growth and survival of the purple sea urchin Strongylocentrotus purpuratus. Pan-American Journal of Aquatic Sciences, 5(3): 414-420. Download PDF file (212 Kb). Angelini, R., Alo�sio, G. R. & Carvalho, A. R. Mixed food web control and stability in a Cerrado river (Brazil). Pan-American Journal of Aquatic Sciences, 5(3): 421-431. Download PDF file (494 Kb). Ramos e Silva, C. A., de Miranda, L. B., D�valos, P. B. & da Silva, M. P. Hydrochemistry in tropical hyper-saline and positive estuaries. Pan-American Journal of Aquatic Sciences, 5(3): 432-443. Download PDF file (294 Kb). Teresa, F. B. & Casatti, L. Import�ncia da vegeta��o rip�ria em regi�o intensamente desmatada no sudeste do Brasil: um estudo com peixes de riacho. Pan-American Journal of Aquatic Sciences, 5(3): 444-453. Download PDF file (226 Kb). Duncan, W. P. & Fernandes, M. N. Physicochemical characterization of the white, black, and clearwater rivers of the Amazon Basin and its implications on the distribution of freshwater stingrays (Chondrichthyes, Potamotrygonidae. Pan-American Journal of Aquatic Sciences, 5(3): 454-464. Download PDF file (568 Kb). Montealegre-Quijano, S. & Ferreira, C. N. Incidental catch of a franciscana dolphin Pontoporia blainvillei (Cetacea, Pontoporiidae) in a pair trawl off southern Brazil. Pan-American Journal of Aquatic Sciences, 5(3): 465-468. Download PDF file (131 Kb). Ron, E., Guardia, J. C. & Tavares, R. First record of the dogfish shark, Squalus acanthias Linnaeus 1758 (Elasmobranchii: Squalidae) for Venezuela and the Caribbean Sea. 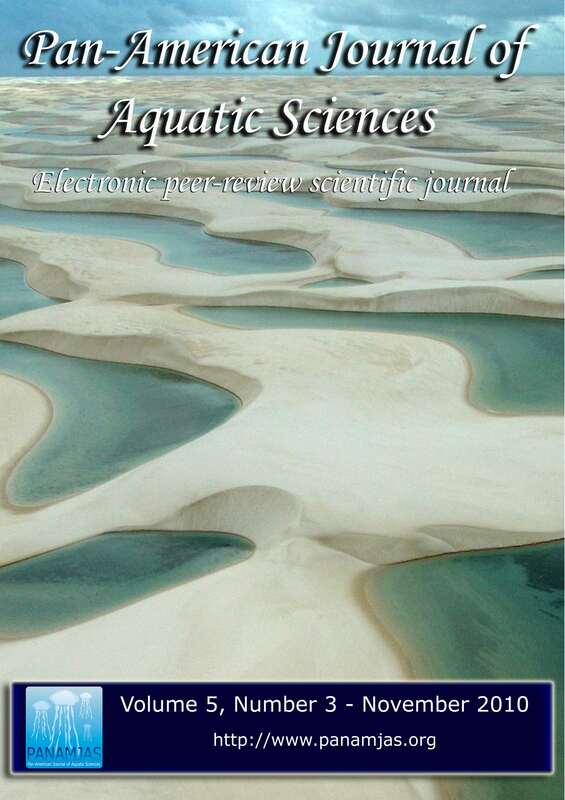 Pan-American Journal of Aquatic Sciences, 5(3): 469-473. Download PDF file (250 Kb). Madureira, L. A. S. P. & Costa, P. L. Detection of the Whitemouth croaker (Micropogonias furnieri) and entangling nets using acoustics in the estuarine shallow waters of the Patos Lagoon (Southern Brazil). Pan-American Journal of Aquatic Sciences, 5(3): 474-477. Download PDF file (1,875 Kb). �vila, R. W., Brito, E. S., Barrella, T. H., Strussmann, C. & Silva, R. L. Endoparasites new to the Neotropical freshwater turtle, Mesoclemmys vanderhaegei (Bour 1973) (Testudines, Chelidae), from central Brazil. Pan-American Journal of Aquatic Sciences, 5(3): 478-480. Download PDF file (414 Kb). Mnasri, N., Kamel, O. E., Bouma�za, M., Ben Amor, M. M. & Capap�, C. Confirmed occurrence of a rare teleost species in Tunisian marine waters: the shortnose greeneye Chlorophthalmus agassizi (Osteichthyes: Chlorophtalmidae). Pan-American Journal of Aquatic Sciences, 5(3): 481-485. Download PDF file (462 Kb).